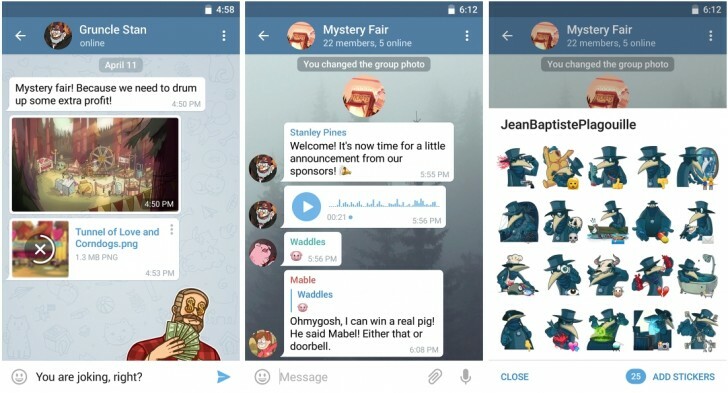 Telegram which happens to be one among the cool instant messaging platform have launched an update on its bot system, which they call The Bot 2.0. With this update, Developers would have an opportunity to create more cool bots and users can enjoy even more functionalities. The Telegram team, also added some new bots like the @music bot which gives you access to share “Free to Share” classical music within a message. Another added bot is the @Youtube bot that lets you search for a YouTube video and share with your friends. You can also connect the bot to your YouTube account for even more great features. that’s not all, The @Sticker bot lets you share cool emoji within the instant messaging platform. Bots also have access to more permissions. The @foursquare bot can use your location to suggest you places around you and then you can type on any item to post it in a chat with location. Apart from that, the App also came with new UI features on both the iOS and Android version. We have also got some cool refinements to the design of the chat bubbles, progress bars, buttons, colors, documents and attachment view and more. Another cool changes is the ability to view YouTube videos in a pop up window without interrupting your chat. Actually, these updates have already been rolled out on both the iOS and Android version. Already enjoying this feature? Tell us what you think using the comment box below.